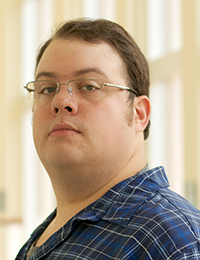 Benjamin G. Stickels is the Audio Engineer and Assistant Production Manager for the Performing Arts Services: Design and Production unit in the College of Arts + Architecture at the University of North Carolina at Charlotte. In addition, he is also an active freelance designer and engineer, having designed and/or engineered professional and academic theatre shows, including world premieres, in Missouri (Unicorn Theatre, Actors Theatre of Kansas City, Kansas City Repertory Theatre, University of Missouri – Kansas City), Texas (Texas Shakespeare Festival), Michigan (Western Michigan University), and North Carolina (University of North Carolina at Charlotte, Children’s Theatre of Charlotte). He holds the Bachelor of Arts in Theatre, with emphasis in Design and Technical Production, from Western Michigan University and the Master of Fine Arts in Theatre Sound Design and Technology from the University of Missouri at Kansas City. For the College of Arts + Architecture, Mr. Stickels serves as the resident sound designer, typically designing sound for productions by the Departments of Theatre and Dance, and as the house engineer, designing and implementing systems for those events. He also serves as the recording engineer for the Department of Music, recording all regularly scheduled concerts and other events on campus. He is also involved as a media and projections technologist, designing and installing cueable systems for theatre and dance events as needed. Academically, he teaches courses for the Department of Music (Music 1403, Audio Engineering Practicum) and the Department of Theatre (Theatre 4236, Audio Engineering). Mr. Stickels holds memberships in the United States Institute for Theatre Technology, the Audio Engineering Society, the Shakespeare Association of America, and the South Eastern Theatre Conference.